These are the components that make the MEGA TORQ stronger and more reliable than anything before. Precision machined pump assembly featuring moly burnished hardened ground pump gears, precision ground rotor chambers provide maximum efficiency, pressure and fluid volume. The pump cover features a superior quality pump seal, a staked in quality babbit bushing and a new case vent. (Competition models have this vent closed and relocated to the rear). The high drum/stator support bearing surface is molybdenum burnished to drastically reduce friction and accelerated wear. Chromium seal rings that provide maximum seal under extreme pressures, are installed in champhered ring grooves reducing side load wear. Grade 8 bolts are used to attach the support to the pump cover and to attach the pump to the transmission housing. NOTE: THE HIGH VOLUME PUMP IS OPTIONAL. 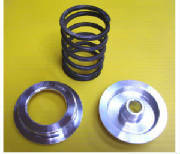 Precision polished input shaft , forward clutch hub and drum are utilized. The input shaft is carefully inspected, ground to tight tollerences at bearing surface, ring grooves champhered and output shaft bearing installed. 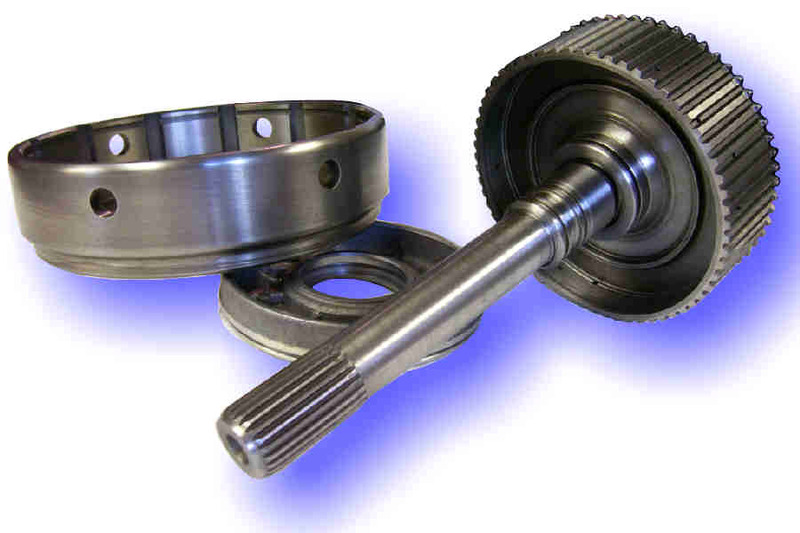 The input drive hub is machined to ensure complete clutch spline contact for maximum torque capacity. The oil relief holes are enlarged to increase fluid flow to the high clutch pack for improved cooling and maximum fluid surface contact on high frictions for dramatic wear reduction. The inner surfaces on the piston side are polished to assure complete lipseal contact for maximum piston apply pressure. 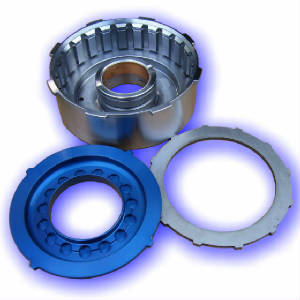 The outer drive drum is champhered and stress relieved to increase torque capacity. CNC machined C1040 BILLET STEEL or 7075 T6 BILLET ALUMINUM HIGH GEAR DRUM is used in every SMR MEGA TORQ 727. Any application which will see street use will utilize the steel drum while competition only applications will use the aluminum version. A BILLET ALUMINUM APPLY PISTON which provides 55% more piston apply area and doubles the clutch clamping force than stock is used in either drum. This results in double the clamping force of stock. 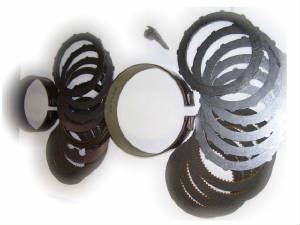 5 or 6 clutch plates are used (depending on the specific application). 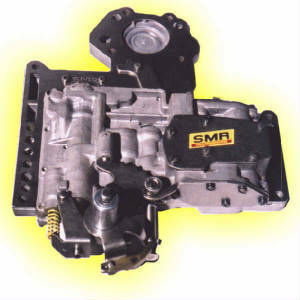 Dual oil apply passages provide even piston apply for maximum clutch capacity. In addition to the obvious performance advantage of these drums, the most important issue is SAFETY. This billet drum helps prevent the violent and catastopic explosion that could occur with the use of the stock powder metal forging, in the event of a driveline and/or sprag failure. The output section of the SMR Mega Torq 727 receives extensive performance upgrades to assure the transfer of the torque without failure. The 5 pinion front planetary (R1)has been manufactured with a steel spline to prevent the spline stripping common with aluminum carriers. and considerable friction reduction is acheived by replacing the thrust washers with large enclosed Torrington needle bearings(R2). The governor assembly(R6) has been eliminated and the park gear (R7)lightened for weight reduction. Our billet steel output support (R8)utilized a large roller bearing providing the greatest axial support and the strongest assembly available. We Utlize the 16 element, 6 bolt, low roller clutch(R9) which is absolutely the strongest on the market. Both annulus units (R3&R5)receive extensive reinforcement for reliability. The low/reverse drum(R10) is supported by a large internal roller bearing, reducing drag, and integrated with the billet support. 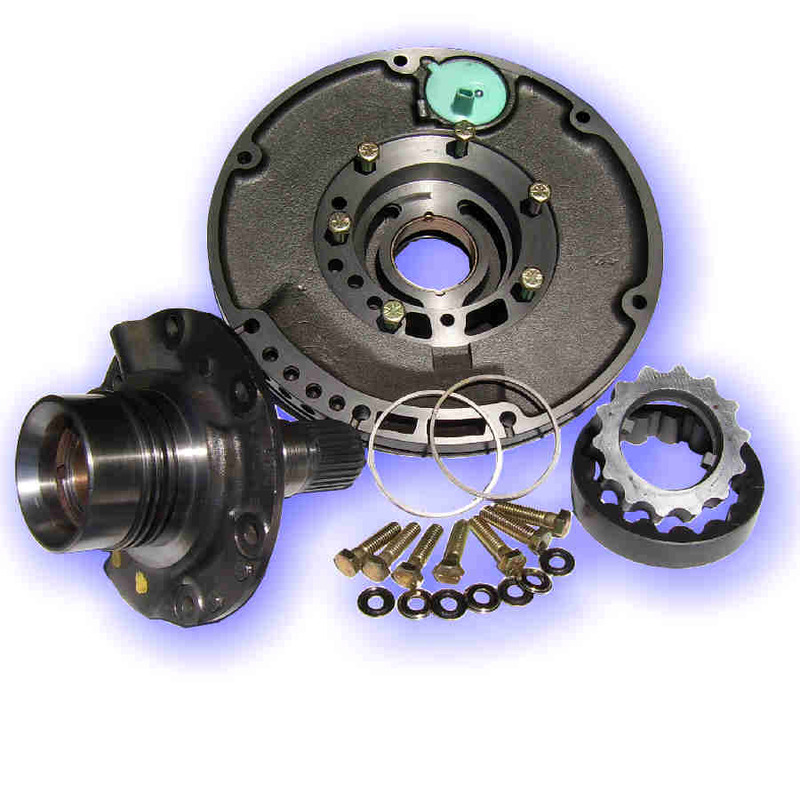 These components transmit the torque through a polished output shaft which is supported by a new roller bearing in the tailhousing. The BILLET STEEL REAR SUPPORT provides the ultimate drivetrain stability and axial support possible for the 727. Its' inherent strength effectively reduces the deflection and shaft misalignment that can lead to accellerated wear on clutches, planetaries and bushings, resulting in greater reliability and reduced component drag. 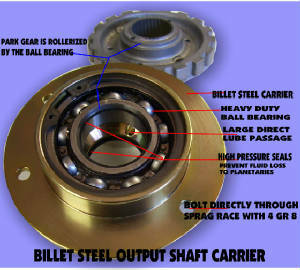 Unlike the modified stock aluminum supports with internal roller bearings providing support to the output shaft and low/reverse drum used by many, this billet steel support utilizes heavy duty BALL BEARINGS that drastically reduce resistance, provide dynamic load capacity (that eliminates shearing off the bearing support under extreme torque loads), provides unrestricted lube flow to the output shaft and planetaries (needle bearings in the support create restriction in lube flow generating heat) and provide stability for the rear drum preventing band drag and early wear. 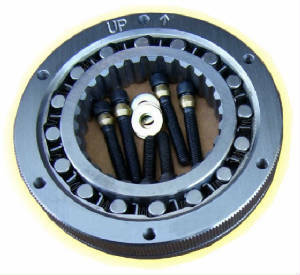 THE "ULTRA SPRAG" is the strongest, most reliable, roller clutch available. 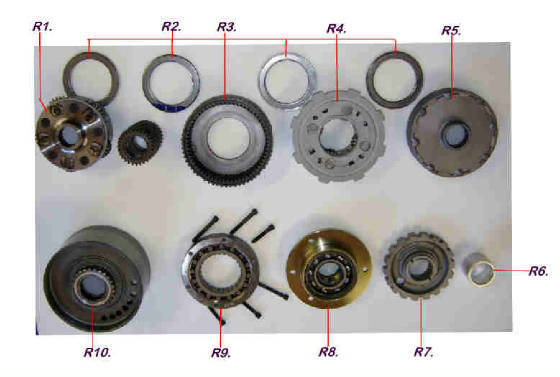 For years the roller clutch (often referred to as the sprag) in the Torqueflite 727 was the weakest link and feared by most for its' devistating impact on the transmission if it failed. The steep ramps and weak cast-in support in the rear of the case would often fail in the event of driveline breakage or low gear burnouts. Attempts were made to reduce this problem by drilling and threading the outer race to permit bolts through the case to anchor it more securely, however under high torque applications the outer race would fail at the drilled bolt holes often leading to high drum explosion. The new design in roller clutch utililizes 16 rollers instead of the stock 12 providing a 30% apply capacity increase. The ramp angles on the outer race are substancially reduced resulting in much less outward shock load and a thicker stronger outer race preventing breakage of the outer race. The spring cage is dramatically heavier than the stock unit to prevent the common rollover problem. The roller race is secured to the case with 6 Grade 8 screws - 4 through the billet rear support and 2 through the case for maximum capacity. 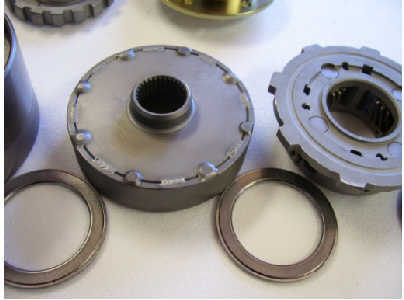 THE "DOUBLE WELDED" ANNULUS RING GEARS which prevents the event of component separation when transferring the severe torque loads from the planetaries to the output shaft. THE 4 GEAR ALUMINUM PLANETARY CARRIER which is machined to accept Torrington bearings that eliminate drag, reduce heat and prevent metal fatigue created by friction stress. 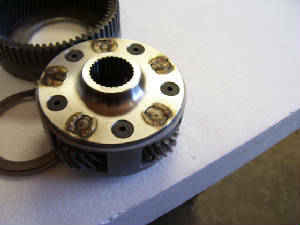 THE 4 GEAR BILLET STEEL SPLINED FRONT PLANETARY. This setup eliminates the stripped splines common with the stock aluminum splined planetary carriers. The billet Steel cover provides substancial increase in load transfer capacity in 1st and 2nd gear application where the broached splines in the stock cast carrier are extremely vulnerable to stripping under high torque. Note: The MegaTorq for street use or blower applications uses a solid steel planetary carrier, while the race version uses the steel capped aluminum carrier for reduced inertia weight. Only the cleanest shifts (no shift overlap or lag) will provide the clutch apply necessary to handle the massive torque loads for which the MegaTorq is designed. Converter apply pressures, lube and cooling circuits and anti-drainback functions must also be precisely engineered into this valvebody. OPTIONAL: Is the TRANSBRAKE Valvebody (with operating features of the Competition Eliminator valvebody) with the ability to electonically lock the transmission for instantaneous launches. and for certain Street Only Applications, a LOW BAND APPLY Valvebody. The 2nd gear apply lever is a billet,hardened steel,4.2:1 ratio to increase the band apply pressure for a quick, firm shift and to increase band clamping force. 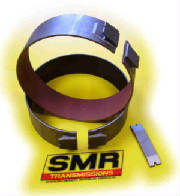 Only the best NORTH AMERICAN made frictions, bands, steels, seals, gaskets and filter are utilized in an SMR Transmission. Utilizing an inferior material may be cheaper to purchase but it will drastically reduce reliability and performance. Every MEGA TORQ transmission utilizes a NEW COMPETITION CAST BAND (which is 10% wider than the original 727 cast band), with a friction material selected to match the specific application in which it will be used. FRICTION MATERIAL (on clutch plates) is carefully selected to provide the ultimate performance levels through the wide range of heat, pressure and speed without performance fade in the specific application for which the transmission is constructed. Friction material selections of high energy Kevlar, Raybestos Stage 1 and gen2 Blue are utilized. Superb quality STEELS designed with a specific surface texture to enhance the characteristics of the friction material utilized and precision drive tabs to transfer torque to outer drive slots without distortion or accellerated drum wear, are used. Seals and gaskets are all American made components designed to withstand extended high pressure, high temperature use without fatigue, advanced hardening or deterioration. Sealing rings are a choice of selected chromemoly, teflon and precison metal components to assure longevity and critical fluid transfer under extreme pressure. Like all SMR Transmissions, every critical dimension and surface is carefully inspected and machined to precise specification. All bearing surfaces, clearances, bores and end plays are BLUEPRINTED with precision. 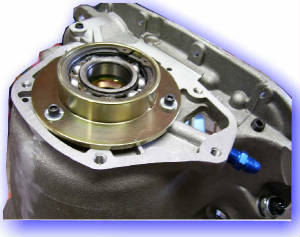 Every bearing and contact surface is assembled with and liberally coated with Moly-Slip ATS (a Molybdenum LUBRICANT specifically formulated to remain in suspension in the fluid and adhere only to metal components without reducing friction co-efficiency or adversely affecting seals) to prevent wear on startup and reduce the need to break-in the unit. Every aspect of the operation of the transmission is HIGH PRESSURE COMPRESSION TESTED to confirm precise operation of all circuits. This method of testing assures peak performance of the finished product. NOTE: ALL PRICES QUOTED ARE IN U.S. CURRENCY and APPLICABLE ONLY TO SALES WITHIN U.S.A. SHIPPING COSTS ARE IN ADDITION TO PRICES QUOTED.